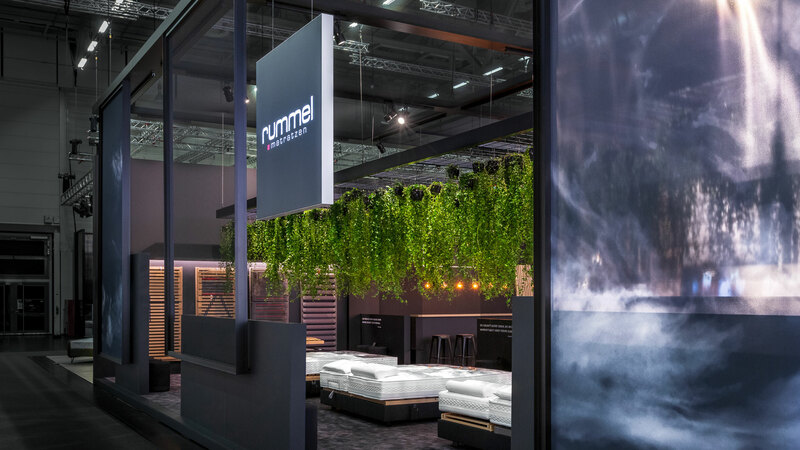 The mattress manufacturer Rummel from Neustadt an der Aisch in Bavaria has been an integral part of the imm cologne for years. As in previous years, 2019 Dart again took over the conception and development of the presentation. A lot of space for communication was at the centre of this year's design. More than a third of the total area is planned for communicative purposes and interaction with visitors. Large tables with a workbench look provide ample opportunity to learn all about the products. In the background there is a booth-wide product sample library. It offers insight into the various product worlds of Rummel and the materials used. In order to visualise Rummel's handcrafted character and high standards of individuality and quality, as many elements as possible were brought from the Bavarian manufactory to the Cologne exhibition halls. The work of Rummel can thus be experienced by everyone. Die Galerien zeigen Produkt- und Lösungsvorschläge auf. For product presentation, Dart stages the front third of the stand. The mattresses and slatted frames are presented to the visitor on small platforms. When the guest lies down, the view turns to a green ceiling. Here gardens of hanging plants create a relaxing atmosphere so that nothing disturbs the concentration on the product. Once again Dart has created a long-lasting presence for Rummel mattresses. The sustainability aspect and the desire for more space for communication were realized by Dart for everyone to experience.